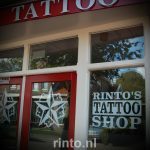 Hey Dutch Tattoo Friends, I am excited to anounce that I will be tattooing in one of the best dutch studios, at Rinto´s Tattoo Shop in Burgum, Holland. From Tuesday 9th to Saturday 13th April 2013. If you are intrested in getting a new one…contact Rinto´s Tattoo Shop. http://www.rinto.nl for more information.